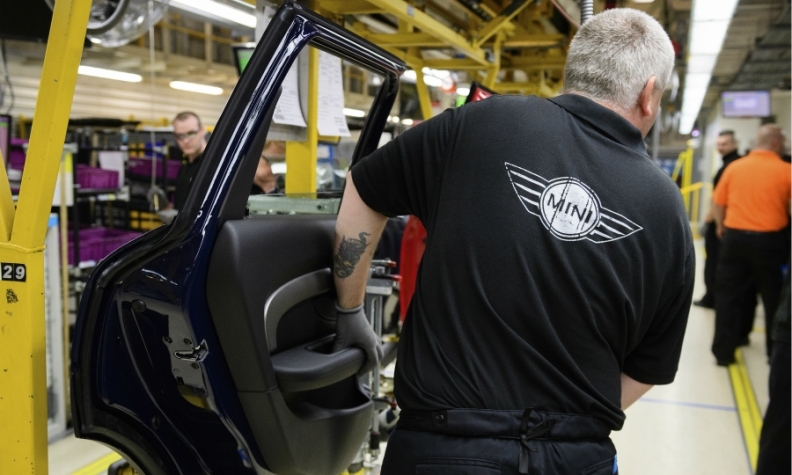 BMW has said it has the flexibility to move production of its brands, including Mini, outside the UK if post-Brexit conditions are unfavorable. LONDON -- UK car production rose by 8 percent in February to its highest level in 17 years, extending a recent trend of surging output as a strong rise in exports once again compensated for a slump in demand at home, the Society of Motor Manufacturers and Traders (SMMT) said in a statement on Thursday. Overall production hit 153,041 cars last month, according to the SMMT, boosted by a 13 percent increase in sales to overseas markets. The roughly 15 percent fall in the pound against the euro since the Brexit vote has helped to make British exports cheaper to many foreign buyers, although it has increased the cost of importing parts from the continent for UK-assembled models. Britain's overwhelmingly foreign-owned car industry backed remaining in the European Union and is worried about the possible end to tariff-free business with Europe, its biggest export market, despite reassurances from Prime Minister Theresa May. BMW said this week that it is reviewing its factories in the UK ahead of Brexit and that it has the flexibility to move production elsewhere if necessary. The automaker builds its Mini brand in Oxford, Rolls-Royces in Goodwood and engines in Hams Hall. "We must avoid barriers to trade, whether tariff, customs or other regulatory obstacles, at all costs," said SMMT CEO Mike Hawes in the statement. "To do otherwise would damage our competitiveness and threaten the continued success of UK automotive manufacturing," he said.